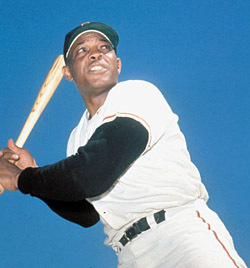 During the 1959 All-Star Game in Pittsburgh’s Forbes Field, Willie Mays went 4-for-4, tripling home Hank Aaron with the winning run in the ninth. Mays continued to excel on the All-Star stage. In 1965 in Minneapolis, he homered in the first inning to help the NL win the game. 1973 marked the debut of the designated hitter and 24th and final All-Star appearance of Willie Mays, arguably the greatest all-round performer in Mid-Summer Classic history. Over the years, Mays batted .307 with 23 hits, including three homers, three triples and two doubles. He also made many spectacular defensive plays. 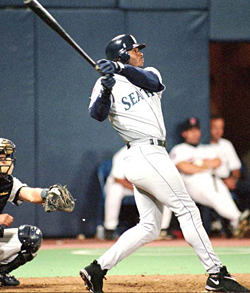 Another future member of the 600 HRC, Ken Griffey, Jr. (617 and counting) also took home the best-of-the-best honors on July 14, 1992…equaling the feat that his father Ken Griffey, Sr. achieved during the 1980 season. “The Kid” went 3-for-3, including a home run deep into the upper deck of San Diego’s Jack Murphy Stadium off Chicago’s Greg Maddux. It marked the first time in history a father and a son smacked All-Star round-trippers—Senior hit one off the Yankees' Tommy John on July 8, 1980. After becoming the first Mariner elected to start the All-Star Game, Junior took home the game's MVP award. On thing All-Star Game fans can count on is that the starting outfielders will be among the most powerful sluggers of their generation. Over the past several decades, the presence of 500 Home Run Club members on both the NL and AL rosters for the Mid-Summer Classic meant that a tremendous amount of home run power were represented by just three individuals. * Ken Griffey, Jr. was voted to 2004 All-Star team, but was injured and did not play.